Yes, that’s the whole joke, the implication being that the members of some ethnic groups are overburdened by their historical pasts and to them the rootless American is the ideal foil. The idea behind the joke is also the set-up for the modern horror story, from Jonathan Harker trundling into Transylvania for a meeting with the count about real estate to innumerable stories of unwitting families moving into haunted houses. The creatures aren’t necessarily new, but in old tales their locales were well known—witches lived in the woods, monsters in the uncharted oceans, etc. It took an increasingly mobile, arrogant, and a-historic population to bring this mode of horror tale to prominence. 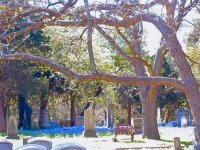 The classic American haunt is the “ancient Indian burial ground,” but when it comes to aggrieved ghosts the cemeteries of slaves and their descendants are pretty tough to beat. Or so the residents of Newport subdivision outside of Houston, TX learned. In 1980, Ben and Jean Williams moved into a new home in Crosby with their granddaughter. Almost immediately, strange electrical problems flared up all around the house and randomly flushing toilets sent their water bills through the roof. Their pet birds died, their granddaughter’s gerbils went insane, and their cat gave birth to a litter of hideously disfigured kittens. Disembodied shadows stalked the house and the family had a constant, palpable feeling of being watched. When Ben and Jean’s married children visited the couples fought, and later divorced. Six close relatives were diagnosed with cancer and three of them died within the year. To be fair, that’s difficult to pin on supernatural forces, but it added to the stress in the house and the vulnerability of its occupants. The Williams weren’t the only family on Poppets Way to be so bothered. Lights and television sets all around Section 8 turned on and off by their own accord. Sinkholes insistently appeared in yards, and reappeared after they had been filled. In 1982, Sam and Judith Haney moved into their custom home across the street. They heard discarnate voices and footsteps in their home. Judith was awakened when an unplugged clock started sparking and glowing. The following year when their contractors began digging their pool, an elderly black stranger knocked on their door and told them the development was built on a pauper’s cemetery and gave them the names of some local families who could verify his story. And sure enough, the backhoe unearthed a man and a woman in crude wooden coffins. The Haneys asked around and found a man named Jasper Norton, who as a youth had been a gravedigger for Black Hope Cemetery. Norton identified the bodies as Charlie and Betty Thomas, who had died more than fifty years before. The Haneys made the unusual decision to reinter the bodies on their property, but may have regretted it when a missing pair of Judith’s red shoes turned up on Betty Thomas’s grave—supposedly on the date of Betty’s birthday. The strange happenings took their toll on the Haneys’ health and peace of mind, and they sued the Newport developers for building on a cemetery and making the residents unwitting desecrators of the graves. A jury awarded them $142,000, but the judge reversed the verdict and ordered the Haneys to pay $50, 000 in court costs. The couple declared bankruptcy and abandoned their home. The decision put the Williamses and their neighbors in a bind. Without producing bodies on their property, they would have no grounds for a lawsuit—and a favorable decision was unlikely even then. On the other hand even if they didn’t produce a corpse, the notoriety of the case (which had been followed in The Houston Chronicle and other press) stymied their attempts to sell their homes. Frustrated and furious, Jean Williams began to dig in her backyard near a tree with strange markings on it that Norton claimed indicated the graves of two sisters. When she became exhausted, her daughter took over—then suffered a massive heart attack that ended her life at age 30. Soon thereafter, Ben and Jean Williams with their granddaughter moved to Montana and left their home to be foreclosed by the bank. In 1993, the Williams with John Bruce Shoemaker published their story as The Black Hope Horror: The True Story of a Haunting, which was subsequently made into a nifty TV movie starring Patty Duke and called Grave Secrets. And similarities between the Williams’s story and the movie Poltergeist? Well, that film came out the year the Haneys moved into their home, which doesn’t preclude it from being an influence on the Williams’s account. But several other families fled Section 8, defaulting on their loans—it’s difficult to chalk it all up to book and movie deals. In the tale’s cyber afterlife, a woman who claimed to have known the Williamses in Crosby posted a review on Amazon.com that was dubious of the account. On the other hand, another reviewer with family in the area tended to believe it. A third drove through the area with her husband after reading the book and within a year, both of their mothers had died, their car had a cracked block, and their marriage ended in divorce. All of which comes to little other than some strange cases continually attracting attention over the years. Others are covered up so thoroughly that they don’t get a public airing for decades and by then only rumors remain. Such a incident happened in Liverpool in the early seventies. According to Liverpudlian ghost hunter Tom Sleman, in winter 1971 several families in the Old Swan district began hearing a thumping sound similar to a human heartbeat that seemed to originate somewhere in the ground beneath their homes. The sound grew in intensity until about midnight, when it abruptly ceased. The sound returned intermittently over the next few weeks, and gave one resident such terrible migraines she moved out of the area. The neighborhood council investigated, but could find no source for the sound. In September of the following year during an especially noisy instance of the phenomenon, a local woman’s bath was interrupted by the appearance of grotesque, skull-like faces that appeared in the steam on the washroom windows. Her husband, Mr. Jones, heard her screams and watched as the faces appeared and faded for a few minutes, then the noise stopped and the faces melted into streams of condensation. The following night, their neighbor claimed to have awakened from a nap to see a crowd of skeletal people in her parlor, leaning toward her and watching her intently. The fright gave her a heart attack that claimed her life later that week. The following night, the Jones’s teenaged daughter dropped a cup of tea and the entire family watched as the liquid formed the shape of a skull then evaporated. The night after that, a night watchman told Mr. Jones that he had been chased by a figure that looked like a medieval monk that appeared out of nowhere and disappeared just as mysteriously. The monk was to appear again throughout the years, but the Jones had had enough and moved to another part of the city. The following year, the city scheduled the row of homes of which the Jones residence had been a part for demolition. The workmen heard the strange sounds and once were amazed to see one of their backhoes tipped onto two side wheels as if pushed by powerful wind that affected nothing else in the area. The following day, the crew made an astonishing discovery—3,561 coffins. The corpses were allegedly grouped by age (from about ten or twelve to early thirties), and a rumor began that the sternums had been smashed and the hearts removed. Word of the mass grave reached London and archeologists made a dash for the scene, but they were horrified to learn that the city council had exhumed every body, cremated them, and buried the ashes. The burial pit was ruled to have been from the 1700s at the earliest and was likely not a plague pit, but the archeologists could deduce little more. The story was also effectively buried and the deplorable sneakiness of the Liverpool government wasn’t fully revealed until September 1981 in the Catholic Pictorial. The bodies were more likely the remains of starving Irish refugees who poured into the port city even before the great potato famine. Ireland had been cordoned off into estates and the land owners paid their starving tenants a pittance to move. In fact, Ireland is the only country in Europe that has a smaller population today than it did in 1845. City life was horrid in the nineteenth century. 39% of London’s children were dead by age nine. The English population of Liverpool about 51% of their children lived to that age, but among the Irish immigrants only about 36% did. The Irish tended to sink into cramped and filthy basements where they sickened and died by the dozens nightly. Hundreds of British troops were sent to Liverpool to contain the restive Irish population, and may have been responsible for the grave—it does smack of weird bureaucratic tidiness. 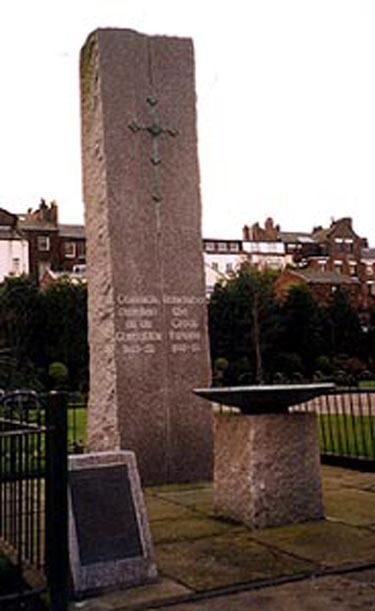 But the only official monument to the countless thousands of Irish dead wasn’t erected in Liverpool until November of 1998, a simple slab with rough edges on the grounds of St. Luke’s Church. Rumors of other secret mass graves in Liverpool persist, with one of the more lurid tales claiming they form a crucifix that points west in mockery of traditional eastward pointing cruciform churches. And another mass grave was planned as late as last summer as the resting place for more than a thousand babies’ bodies—most stillborn—and other fetal tissue that were discovered stored for no defensible reason on the grounds of the city’s Alder Hey Children’s Hospital. The oldest of the bodies had been stored on the premises for more than twenty years. There’s no doubt that this world is lousy with the unmarked graves of forgotten occupants. But no matter how much time has passed, or whether any survive to tell the tales, perhaps something remains and insists we remember.